I ended the previous post by linking to Nicole King, a biology superstar who has a genius award under her belt and whom I was lucky enough to see here at the marine station. She gave a great seminar, the kind which left me thinking--momentarily, at least--"Forget cephalopods. I want to study choanoflagellates!" Before I explain why they're so awesome, let's go back to classification for just a moment. Remember the domain Eukarya? It gets broken down into "supergroups" that separate out a lot of things that used to just be lumped into Protista (i.e. little single-celled beasties). If you're really burning to see a list of all the supergroups, Wikipedia has one--scroll down until you find the domain Eukaryota*. The only thing that's really worth noting is that Kingdom Plantae is in an entirely different supergroup than Fungi and Animalia (which are both in the supergroup Opisthokonta). Just as we were all surprised to find that Eukaryotes are more closely related to Archaea than to Bacteria, it's a bit unexpected that Animalia are closer to Fungi than to Plants. Recall the coolness of multicellularity, and how it lets eukaryotes get really big? The best part is that eukaryotes didn't figure out multicellularity just once. We're pretty sure that it evolved multiple times. That means ancestral plants, animals, and fungi each figured out independently how to be multicellular. Not only that, but even within the plants, there are thought to be multiple multicellular lineages. I think at last count there are something like a dozen independent origins of multicellularity, and even this number is thought by some to be a significant underestimate. However, if we just look at Kingdom Animalia, it's supposed to have arisen from just one multicelluar ancestor. That makes things simpler. So let's examine the origins of animal multicellularity. The simplest group of animals is the sponges, Phylum Porifera. Compared to the extensive differentiation of tissues and organs that goes on in other animals, sponges are little more than glommed-together cells. But they do have different cell types. 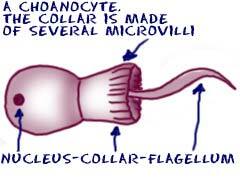 One of the cell types that they have is called a "collar cell", because it has a single flagellum (there's that opisthokont) surrounded by a little collar of microvilli. Collar in Latin is choano so these cells are also referred to as choanocytes. It doesn't take a genius to speculate that these two types of cells--one its own self-contained organism, the other a participant in the multicellular miracle that is a sponge--have a common ancestor. The question is, how common? Do choanos and animals share enough that we can look towards their similarities to give us hints about the evolution of multicellularity? In my heirarchical diagram above, I've placed fungi, choanos, and animals on the same level, implying that they are all equally related to each other. That's highly unlikely. There have been conflicting theories published about who is most closely related to whom, but King has provided strong molecular evidence that the choanos and animals are more closely related to each other than to fungi. Given that common ancestry, she starting looking in choanos for genes that are characteristic of animals--and in particular, genes that animals use for multicellularity. What's that mean? Well, for multicellularity to work, it is fundamentally necessary that cells be able to communicate with each other. Just as in any society with division of labor, individuals must be able to express their needs and trade their products. Cells communicate by means of signaling molecules and receptors. Receptors are transmembrane proteins, which means they have a bit on the outside of the cell and a bit on the inside of the cell. Signaling molecules sent from other cells can bind to the outside bit of a receptor, which starts a biochemical chain reaction inside of the cell, so that it can respond to the signal. All of your proteins are encoded in your DNA, but not all of your DNA gets translated into proteins. Forgetting about junk DNA for the time being, not even all of your functional genes get translated into proteins. Some of them are only turned on at some times, and some never get turned on. So what scientists have figured out how to do is to look at an organism's RNA** to see only those genes that the organism is actually transcribing and turning into proteins. King & Co. looked at choano RNA, and found out that they have a whole mess of transcribed genes (and thus proteins) that have only ever been found in animals before. And such proteins! They found receptors in choanoflagellates that are used in animals for adhesion and signaling between cells. Smells like multicellularity! It's not quite that simple, of course. Choanoflagellates aren't multicellular, and they aren't the ancestors of animals. But they may provide some hints about where animal "multicellular" genes came from, before the evolution of multicellularity. Some of the receptors might have been used for prey recognition. And some of them, more excitingly, may have been used for colony formation. Now colonies, as I mentioned before, aren't multicellular organisms. But they could well be the first step. And there are some colony-forming choanos . . . which is just about the coolest thing ever. Proterospongia has a misleading name, since it is not the ancestor of sponges. But it may be the best approximation we've got as to where this whole animal thing got started. * No one really seems to care whether you say Eukarya or Eukaryota. My cherished textbook, Campbell's Biology, uses Eukarya, and so do I. ** Messenger RNA, or mRNA, to be precise. RNA comes in different flavors, and it's mRNA that plays the key role in the central dogma. rRNA, for example, forms part of the structure of the ribosome, which is the little cellular machine that translates mRNA into proteins . . . I trust I make myself obscure. I don�t usually reply to posts but I will in this case. I�ve been experiencing this very same problem with a new WordPress installation of mine. I�ve spent weeks calibrating and getting it ready when all of a sudden� I cannot delete any content. It�s a workaround that, although isn�t perfect, does the trick so thanks! I really hope this problem gets solved properly asap.